A glass filled with a naturally-colored verte. Beside it is an absinthe spoon. Absinthe is a distilled highly alcoholic drink. It is 45–74% alcohol by volume / 90–148 U.S. proof) beverage. It is an anise-flavoured spirit got from herbs. The herbs including the flowers and leaves of Artemisia absinthium ("grand wormwood"), together with green anise, sweet fennel. Absinthe has a natural green colour but may also be colourless. It is commonly referred to in historical literature as "la fée verte" (the green fairy). It is not a liqueur, because it is not traditionally bottled with added sugar; therefore it is a spirit. Absinthe is bottled at a high level of alcohol, but it is usually diluted with water before it is drunk. Absinthe came from Val-de-Travers, Switzerland. It was very popular in late 19th and early 20th century France. Parisian artists and writers drank it. The romantic associations with the drink still lingers in popular culture. At the end of 1900 the French were drinking over 2 million litres of absinthe a year. By 1910 this had increased to 36 million litres. Ernest Hemingway, James Joyce, Charles Baudelaire, Paul Verlaine, Arthur Rimbaud, Henri de Toulouse-Lautrec, Amedeo Modigliani, Pablo Picasso, Vincent van Gogh, Oscar Wilde, Aleister Crowley, Erik Satie and Alfred Jarry were all known absinthe drinkers. Absinthe has often been thought a dangerous addictive psychoactive drug and hallucinogen. The chemical compound thujone, although present in the spirit in only trace amounts, was blamed for its alleged harmful effects. By 1915, absinthe had been banned in the United States and in much of Europe, including France, the Netherlands, Belgium, Switzerland and Austria-Hungary. However, it has not been shown to be any more dangerous than ordinary spirits. Recent studies have shown that absinthe's psychoactive effects (apart from the alcohol) have been exaggerated. A revival of absinthe began in the 1990s, after modern European Union food and beverage laws removed barriers to its production and sale. By the early 21st century, nearly 200 brands of absinthe were being produced in a dozen countries, most notably in France, Switzerland, Australia, Spain, and the Czech Republic. Absinthe's popularity grew slowly. In the 1840s absinthe was given to French soldiers as a malaria treatment. When the troops returned home, they started to drink absinthe with water. It became popular at bars and bistros. After the 1860s absinthe had become so popular that it was for sale in most cafés and cabarets. By the 1880s the price had dropped a lot, the market got bigger, and absinthe soon became the drink of France. By 1910 the French were drinking 36 million litres of absinthe per year. Absinthe was often linked with violent crimes supposedly committed under its influence. Combined with hard liquor use and the low price, absinthe became a social problem in France. Wine makers groups often publicized problems with absinthe. Journalists blamed absinthe for many social problems. In 1900 absinthe was banned in Switzerland. The banning of absinthe was even written into the constitution in 1907, following a popular initiative. The Netherlands banned absinthe in 1909, followed by the United States in 1912 and France in 1915. Around the same time, Australia banned the liquor too. After the absinthe prohibition, wine and whiskey makers had a big increase in sales. 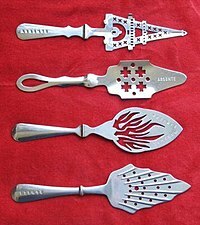 Collection of absinthe spoons. These are special spoons used to hold the sugar cube. Ice-cold water is poured over the sugar to dilute the absinthe. Note the slot on the handle that allows the spoon to rest safely on the brim of the glass. In the 1990s an importer discovered that there was no UK law banning the sale of absinthe. It had never been banned in the UK. Hill's Liquere, a Czech Republic distillery founded in 1920, began manufacturing Hill's Absinth. This was a Bohemian-style absinthe, which started a rebirth in absinthe's popularity. It has never been banned in Spain or Portugal, where it continues to be made. France never changed the law of 1915. In 1988 a new law was passed. This bans only drinks that call themselves 'absinthe' and drinks that do not meet with European Union laws on thujone. Thujone is the chemical which was thought to cause the hallucinatory (bad dream) effect of absinthe. In the Netherlands, the old law banning absinthe was successfully challenged by the Amsterdam wine seller Menno Boorsma. In July 2004 it became legal to make absinthe again. In Switzerland, the constitutional ban on absinthe was removed in 2000 during an overhaul of the national constitution. The ban was written into ordinary law instead. Absinthe is now not only sold in Switzerland, but is once again distilled in its Val-de-Travers birthplace. In the United States the laws banning absinthe are hard to understand. In some states it is legal have a bottle of absinthe, but not to buy or to produce it. The export and import of absinthe is probably illegal. Traditionally, absinthe is put into a glass. A sugar cube is then placed in the bowl of a special spoon. Ice-cold water is poured or dripped over the sugar until the drink is diluted. During this process, the parts that are not soluble in water make the liquid cloudy. The resulting milky opalescence is called the louche. The main herbs used to produce absinthe are green anise, florence fennel and grande wormwood, often called the 'holy trinity'. Many other herbs may be used as well, such as hyssop, melissa, star anise, petite wormwood (Artemisia pontica or Roman wormwood), angelica root, Sweet Flag, dittany leaves, coriander, veronica, juniper, nutmeg, and various mountain herbs. The herbs are first soaked, a step called "maceration". Heat is added in the process of distillation which extracts a pure liquid. 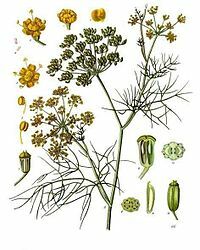 Wormwood, anise, and Florence fennel produce a colorless liquid or distillate that is about 72% alcohol. The distillate can be bottled clear, to produce a Blanche or la Bleue absinthe. A second step can add color to the liquid using artificial or natural coloring. ↑ Chisholm, Hugh, ed. (1911). "Absinthe" . Encyclopædia Britannica. 1 (Eleventh ed.). Cambridge University Press. p. 75. ↑ 'Traite de la Fabrication de Liqueurs et de la Distillation des Alcools' Duplais 1882. 3rd ed, p249. ↑ 8.0 8.1 Padosch, Stephan A; Lachenmeier, Dirk W; Kröner, Lars U (2006). "Absinthism: a fictitious 19th century syndrome with present impact". Substance Abuse Treatment, Prevention, and Policy 1: 14. doi:10.1186/1747-597X-1-14. ↑ "Thujon". The Free Dictionary by Farlex. Retrieved 2008-11-30. This page was last changed on 19 June 2016, at 20:27.